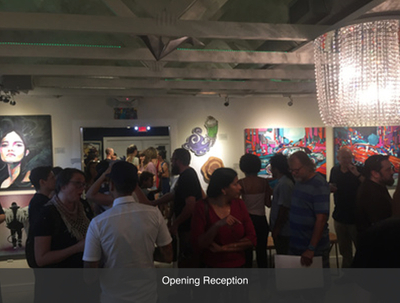 What a superb & glorious opening reception we had for Abstract Absolutely, I See You (photography) & Scene Builders. J Muzacz was extremely generous by gifting 25 prints of each of his Scene Builders’ artworks (2000 Lincoln Town Car & Buick Regal Hard Top) throughout the evening. 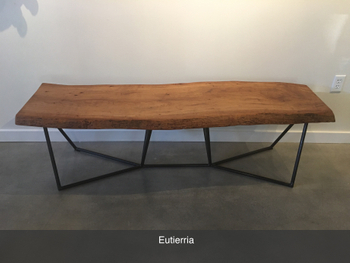 Billy North of North Fabrication delivered Eutierria (Raw steel base with a natural pecan slab from the bottom of Lake Travis) late Friday morning which completed our installation of Scene Builders. Scene Builders is our exhibition of artists who see a blank space and create & design the area to tell a story. We have North Fabrication whose motto is “Design-Create-Innovate”, ATx Muralists who create ever changing artwork on different surfaces and ATx Tattoo Artists who create their art generated from people’s memories & stories of their life. Abstract Absolutely was created to showcase the relationship of color and form with a variety of Austin abstract artists. 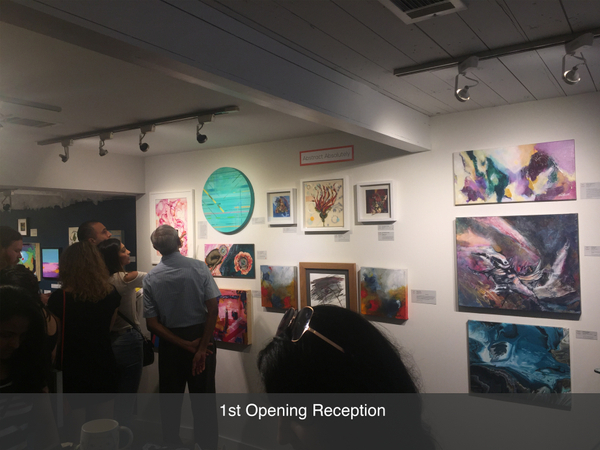 Curating Ab Ab was thrilling (borderline adrenaline rush) since we used space between artwork to create some triptychs by different artists and utilizing the tints & hues of the colorful artwork. I See You is photography by Two Keys Photo (Karen & Steve Jackson), in their own words, “We use real world locations and props to create backdrops into surreal worlds that produce both negative and positive emotional reaction for viewers. Some images are quiet while others almost create a frenzy for the observer.”. Art lovers & exhibition artists mingled and many became “close” acquaintances due to the phenomenally packed gallery space at Art for the People. 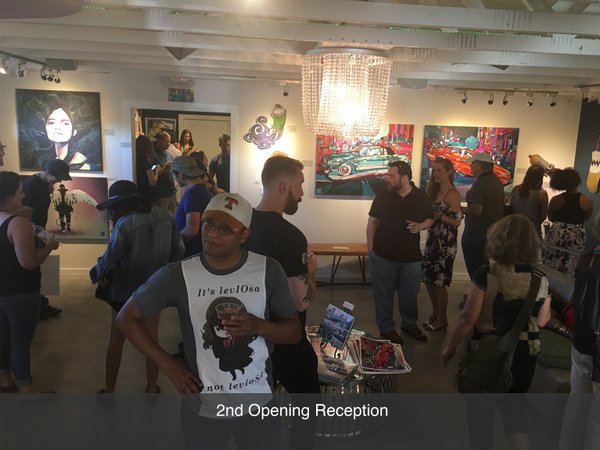 We get so excited with each opening reception with new artworks and an array of Austin artists (some are known to us & others are exhibiting for the 1st time at AFTP). One of our secrets to fun & successful events is finding people who are stellar at what they do…...which led Art for the People to The Austin Wine Merchant!!!! Philip at AWM is a savior & gem who immediately sensed that we wanted something a wee bit different for our opening reception for 3 simultaneous exhibitions (7/21/17). 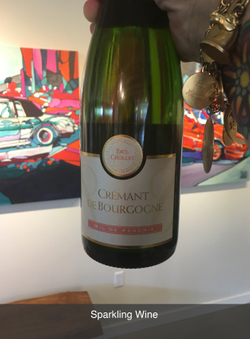 Philip suggested Crémant De Bourgogne sparkling wine to compliment our Buddha’s Brew Kombucha cocktails and WOW WOW WOW what a winner!!! Philip also transported our purchases of Reserve Gin from Revolutions Spirits, Reyna Vodka & the case of sparkling wine to our vehicle. The Austin Wine Merchant is filled with wine & spirits, a skilled team and wines that make me so very happy (at shockingly affordable prices)...check out the Vale Do Bomfim (DOURO 2014) for $11.25 (that’s not a typo) (it’s divine red from Portugal). We have more events planned in the near future so keep updated on Art for the People shenanigans through Facebook & Instagram. We are open & excited to meet you Wednesdays thru Sundays (12N-6pm) (Tuesdays by appt). Have a fun & glorious week & we’ll be back next week with our 3rd blog (squealing with excitement)!!!! !